Engaging employees’ families can build loyalty and affinity amongst staff. Striking a balance between career and personal life can be a challenging prospect. In Singapore, research indicates that work-life harmony is a priority for working adults; it has been listed as one of the 3 most valued characteristics of a job (Accenture 2012) and also a key determinant in whether an individual stays on with their current organisation (Hays 2017). Work-life harmony is one of the most valued characteristics of a job and helps determine if an individual stays on in their company. As employers strengthen their employee engagement strategies to hire and retain the best talent, it is vital to observe what their employees value in life, and find ways to help them meet these goals. A local poll of working adults found that family is ranked as their top priority (Families for Life, 2015). Interestingly, an earlier study also uncovered that half of Singaporeans felt that they spent insufficient time with their families (MSF, 2013). This presents employers with a clear opportunity to invest in the family life of their employees. The old adage is true — a happy employee is a good employee. By empowering staff to bridge the gap between their personal values and their actions, the organisation will nurture a workforce with successful and fulfilled personal lives that will be more present, engaged and motivated at work. Identify the diverse family-life needs of your workforce. Every employee is a unique individual with a unique family situation to match, and contends with different challenges. For example, a working adult may also be a care-giver for an elderly parent, or a parent of young children, or even a newly-wed planning to start a family. The possibilities may seem endless, but identifying these various needs will enable you to pin-point initiatives that will help to strengthen their family life. These may range from support groups for specific demographics — such as single parents and caregivers for the elderly — and offering enhanced leave options, an Employee Assistance Programme or family-life talks and workshops, amongst other options. A workforce with successful and fulfilled personal lives that will be more present, engaged and motivated at work. Design a comprehensive plan for greater sustainability. Workplaces with a deeply embedded work-life friendly culture have one thing in common — a sustainable work-life strategy. As an employer, consider what form you would like your work-life strategy to take on 5 or 10 years from now. This should shape your current plans. When implementing family-life initiatives, consider an inclusive spread of programmes for the different life stages represented in your workforce. By interspersing these throughout the year, you’ll build momentum and interest around these family-friendly initiatives, and keep employees engaged. Have authentic interactions, make real connections. 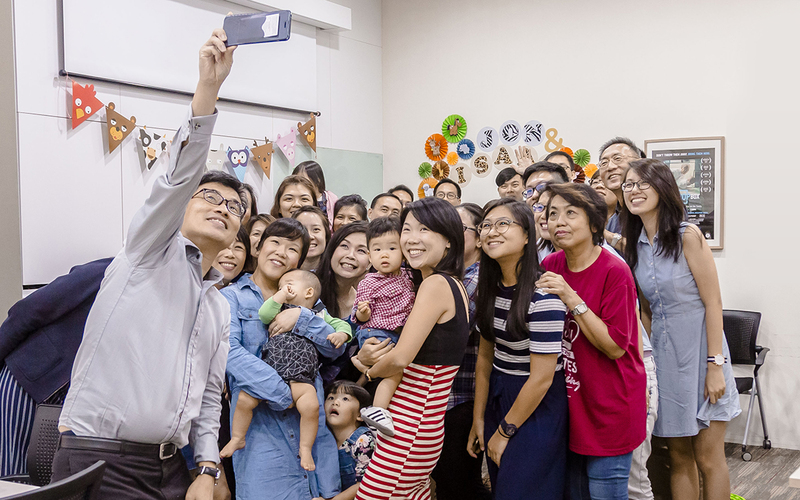 Even as you invest in the family-life of your employees, meeting with these families and getting to know them can be a powerful bonding opportunity. Events such as our work-life initiative Meet My Boss give children a glimpse into their parents’ work lives; seeing and getting to know the workplace and colleagues that these loved ones spend so much time at and with. These initiatives help employers build loyalty and affinity amongst staff. Ultimately, when individuals feel successful in their personal lives, they will naturally be motivated to excel at work as well. By investing in family-life initiatives for your staff, you will equip them to find meaning in their work and fulfilment in their relationships.